This is the first Apollo update which is a direct result of the votes cast in our polls! Many users took the time to express their preference, and the majority wanted to get this feature before the other ones, so in the last two weeks we spent most of our time completing and refining it. The devil is in the details, and even though most of the work under the hood had already been done in the past months, sometimes bringing a feature from 90% to 100% completion takes some serious effort as well. 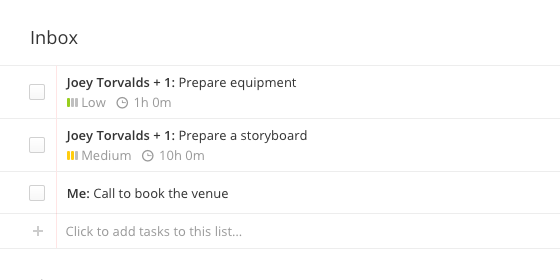 The feature we're talking is about tasks: starting today, you have the ability to assign a task to multiple people! 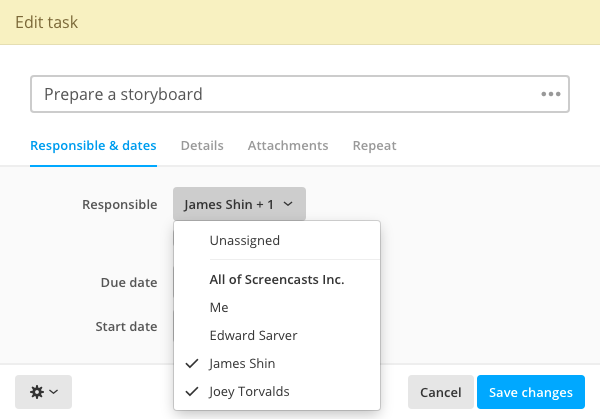 Just select the people you want the task assigned to from the list, and Apollo will do the rest: every responsible will get a notification email, stats and charts will take multiple responsibles into account, tasks will show that there are multiple responsible set (see below), and so on. A task can also be quickly assigned to all the people in a company by clicking “All of company”. We hope this will ease your daily work in Apollo. Please don't hesitate to send your feedback anytime, we love it! Results from the second poll are out! As you may already know, our second feature poll has just ended. As a reminder, available options were “Undelete support in projects”, “Task audit” and “Per user time threshold”. The winner is the Task audit feature, with 46% of all votes. Today, we started a new poll. If you didn't vote yet, you can do it right now. Added the total time in the projects' Time reports. The workspace deletion screen now forces the secure layer (https). Dragging the timer panel wasn't working correctly on Chrome 55+. Image proofing: adding a point-type element over another one would draw it in the top left of the canvas. Calendar event form: when setting a reminder, the date preview when the reminder would go off wasn't updating.